Add 1 inch of oil to a large pot and heat over medium-high heat. While oil is heating, stir together flour, cornstarch, and seasoned salt. 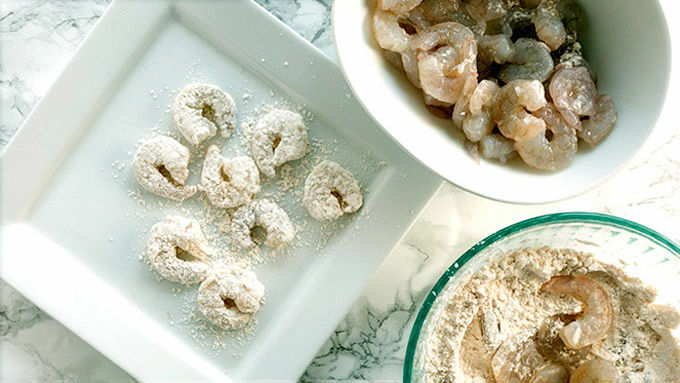 Coat shrimp in flour mixture. 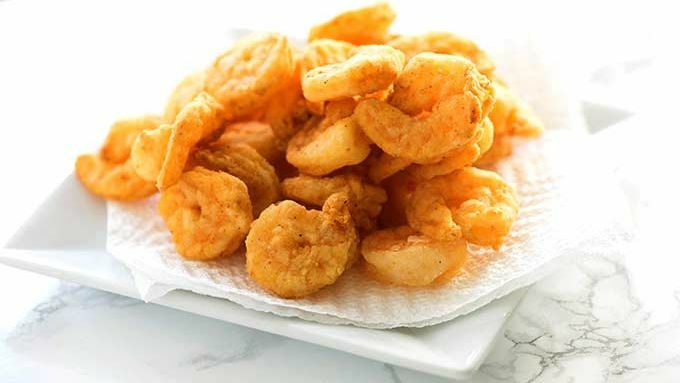 Fry shrimp for 2-3 minutes or until golden brown and cooked through. Drain on a paper towel lined plate. To make sauce, whisk together mayonnaise, chili sauce, and sriracha. Add 1 tablespoon of water to thin sauce. Dunk shrimp in sauce to coat and place on plate to drain. 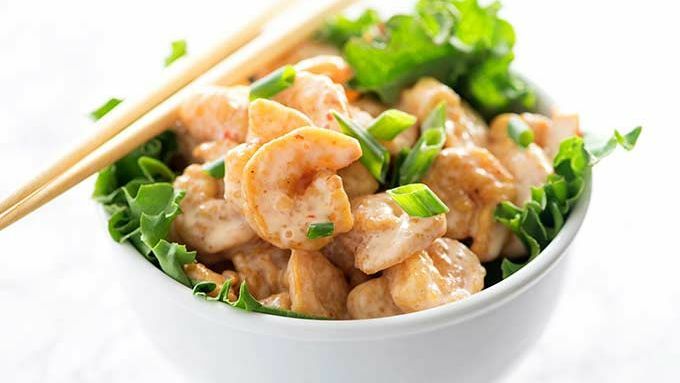 Line bowl with lettuce leaves, place shrimp on top, and sprinkle with green onions before serving. Let’s talk about date night. Or girls’ night. Or whatever night it is that you tend to hit up a favorite restaurant and order up a mess of appetizers. Sooooo, every night? Are we talking about every night? It’s cool. Well, I have been busy perfecting this Bonefish Grill Bang Bang Shrimp copycat recipe so that you can skip the restaurant, save a few bucks, and eat dinner in your jammies. You’re welcome. 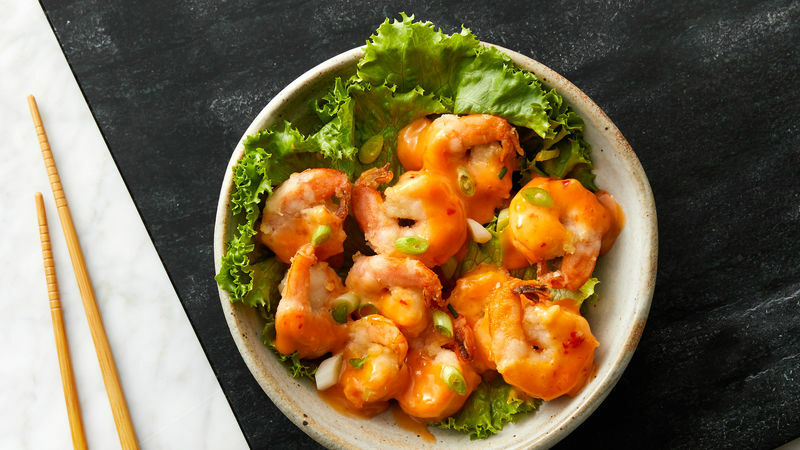 This Bang Bang Shrimp is beyond easy to make. It sounds intimidating, but the sauce is just a few ingredients that you’ve probably got hanging out in the fridge. 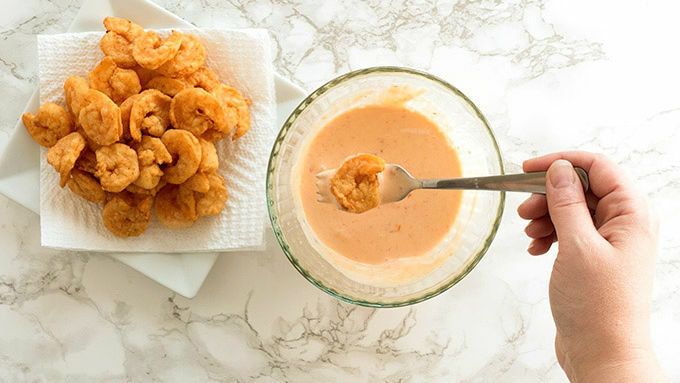 Grab yourself some shrimpies from the freezer and you’re ready to do this. Place the saucy little guys in a lettuce-lined bowl to be all fancy and authentic. Sprinkle with green onions and dive in!